Sometimes pop artists you associate with youth surprise you with a new vocal persona that suits them as they get older. (Think Robert Plant on Raising Sand.) But in the case of Scott Walker, he never really sounded like a young man to begin with. Sure, he was a teen idol back in the late ’60’s who appeared in shades and all that. (See above picture.) But his low voice and refusal to bask in the flower power youthful exuberance of the summer of love made him sound like an old soul who stood apart from a generation that used to say, “never trust anyone over 30.” Rather than join that chorus, Walker wound down the ’60’s with “The Old Man’s Back Again: Dedicated to the Neo-Stalinist Regime.” I’m not sure quite what he meant by that. But I took it to have something to do with a sobering reminder of the terrifying persistence of state power that has proved to be only too prophetic. It made “Back In The USSR” (which I also love) sound comparatively reassuring. Even his love songs were heavy. 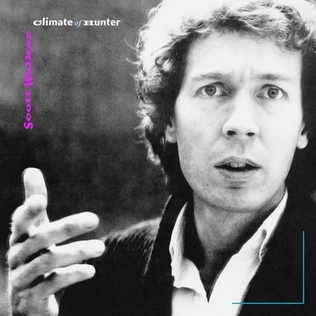 One of my favorite string arrangements of all time comes from the song It’s Raining Today, released in early 1969 on his album Scott 3. The strings shimmer when the song comes in. But their brilliant dissonance bring something of the flavor of a horror movie into this reminiscence of a first encounter. This was not puppy love. Walker has said that the 3/4 tempo in which he wrote this album led him to become something of a pariah to the commercial industry that once swooned over him. His baritone never let you forget about the forces of gravity. No amount of botox can defy them forever. I can’t say the same of the voice of The Thin White Duke. 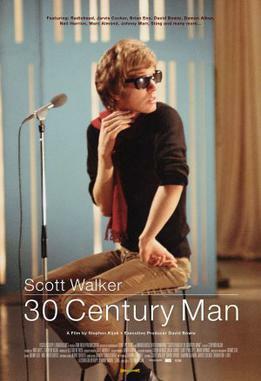 Walker appears as gracefully balding and modestly thoughtful in the interviews in 30th Century Man. I don’t mean to slag Bowie, he helped bring this great movie to us by acting as executive producer. But he does appear to have dyed blonde hair in his also thoughtful interview segments in the film. During one of these, he tells a funny story about feeling jealous of Walker when he was dating a woman who used to go out with Scott. He said he used to feel mad when he’s see Walker’s records lying around her apartment. You can see something of the creative jealousy, which seems to linger to this day, despite the financial disparity. First came Climate of the Hunter in 1984. It shows the mark of the kind of 1980’s production that is now considered to be as misguided as the pastel colors and shoulder pads of fashion of that period. But I think his voice suits that stylistic era very well. ’80’s music, in all it’s sterile slickness – yes, you can sound sterile in the analog realm – never sounded convincing as Rock and Roll in the sense of raw youthful exuberance. But Scott never aimed for that. His music was always heavily orchestrated. The fretless bass, “dughe-duh-duh-duhge” rack toms, glassy digital synths and synthetic reverb sheen suited the alienation his music conveys so well. It also managed to make all that clear sheeny space sound majestic, perhaps inspiring youtubers to choose the following kind of video. 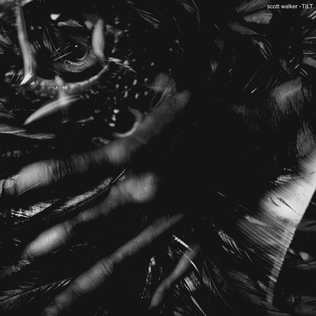 Scott waited eleven years before coming out with his next album, Tilt. The 80’s touches were gone from studios by then. His work departed more from his baroque ballad style and began to remind me more of modern classical music. My favorite song from the record is Bouncer See Bouncer. It’s actually one of my favorite songs, period. We hear a single pounding kettle drum, a pick scraping over strings behind the bridge of an electric guitar, and an ominous synthesizer. The bed of strings we hear on many of his songs is not there. His voice sounds even more heavy without that lightening touch. We don’t get to the “chorus” of the song until 4 minutes and 55 seconds into the song. Here we do hear some softer strings and harp – for a bit. Then we’re back to the kettle drum stomp, which carries on straight through to the end of the song at 8 minutes and 47 seconds. No matter how long, not a second seems extraneous. I couldn’t find a youtube clip of that song by itself, but the title track’s not bad either! Drift came eleven years later (again!) in 2006. In the interview that’s right at the start of the above trailer for 30 Century Man, Scott says that things continue to be stark, and that he and his producer have just managed to refine that quality. In the interview below from that same time, he agrees with the journalist from the BBC that his music has become harder because the arrangements are shaved down to “noises and big blocks of sound.” But he says that the mood remains the same. And then there’s Clara, which clocks in at over 12 minutes. I love how you can’t escape his voice. In the above BBC interview, Scott says he’s working on his next record. That was 6 years ago. Here’s hoping he finishes it. He’ll turn 70 next year. I can’t think of too many people that age whose new records I would be waiting for. No Steel Wheels here! 15 Jul	This entry was published on July 15, 2012 at 7:31 am. It’s filed under Music, Record Reviews, Series of posts, Top 40 Over 40 and tagged 30th Century Man, David Bowie, Drift, Films, Music, Night of the Hunter, Record Reviews, Scott Walker, Tilt, Top 40 Over 40. Bookmark the permalink. Follow any comments here with the RSS feed for this post. Newer: Wanna read Wainaina? You should! 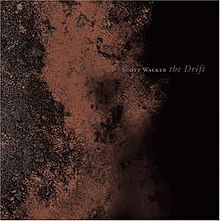 The Drift came out 10 years after you report, in 2006 (I knew it couldn’t have been THAT long between records. This century, at least). Whoops! Thanks for catching that, I changed it.